It was only a few weeks ago when a video surfaced showing former Haitian Senate president Bernard Sansaricq delivering a blistering message to Donald Trump, exposing the Clinton Foundation and explaining how the Clintons tried to bribe him in the early 1990's when he was Senate president of Haiti. 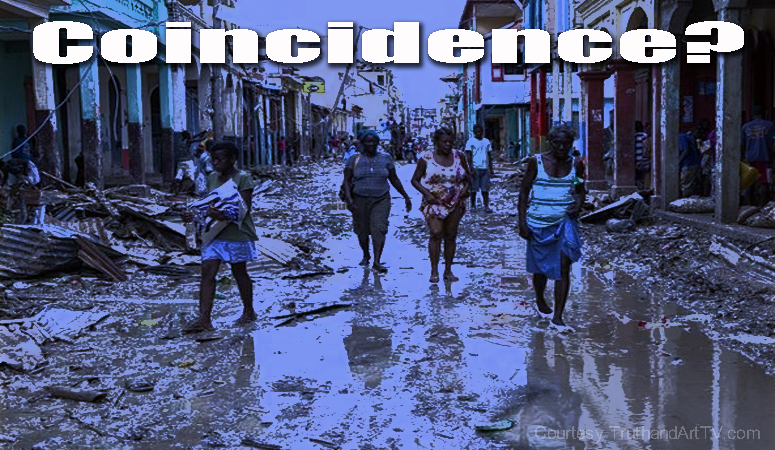 Sansaricq goes on to describe how the massive 2010 earthquake in Haiti was used to steal millions of dollars from Haiti. He even goes on to describe how Clinton (CIA) drug dealing was another way to destroy and steal from Haiti. All of these accusations were very serious. Potentially serious enough to destroy the Clinton presidential run. At the time this was just one more storm for Hillary who has been hit with every possible obstacle, yet thanks to her status, which seems to be well above the law as FBI's James Comey has proven, she has managed to not only stay out of jail but somehow also prolong the life of her campaign. She hasn't done it alone, however. Not only did FBI's James Comey allow Hillary to get away with breaking the law under the concept of "intent" but the mainstream media and the Democratic party have together contributed to Hillary's ability to still be running for president instead of sitting behind bars. The Hillary camp has also resorted to other tactics such as ignoring the accusations leveraged against Hillary, murdering those who present a threat to Hillary, pushing out more propaganda and lies and staying on the offensive attacking, creating and instigating division, distrust and hatred amongst Americans to keep everyone's minds occupied. So there's no doubt the Clinton camp and the western cabal were not very happy about this very credible and very public former Haitian Senate president and his very damning recent statements blowing the lid open on the criminal Clinton Foundation. Fast forward to just a few weeks later and all of a sudden Haiti is destroyed by "Hurricane Mathew", a hurricane which ripped through Haiti this past week and has devastated Haiti while the western mass media hardly pays attention. Coincidence? Wild crazy conspiracy theory? Cold calculated obvious attack by a vicious gang of thugs who are determined to murder all their enemies in their path? You decide. The horrific damage from the hurricane and the catastrophic destruction of life is described by Washington Post. But the sounds Monday night were tremendous, like roaring engines. The winds uprooted towering palm trees and hurled them into the cinder-block shacks all around her. Coconuts landed like cannonballs. Haitians all along the southern coast are now reckoning with the extraordinary toll of that night, destruction on a scale none had ever seen. Along the southern peninsula that was largely spared from the devastating 2010 earthquake, Hurricane Matthew landed a ferocious blow, damaging or smashing thousands of homes, schools and churches, razing trees and crops, and sweeping away farm animals. Hurricane Matthew has killed at least 300 people in Haiti, according to the national government, but the figure was sure to rise as aid teams reached areas cut off by washed-out bridges or fallen trees. A Reuters tally from local and national officials put the death count at more than 800. The town of Chantal and its surroundings are among the worst hit, with 106 confirmed dead. U.N. officials have called the hurricane the country’s worst humanitarian crisis since the 2010 earthquake, which killed about 200,000 people. Residents said people died after being struck by falling trees or collapsing roofs. Others disappeared in the floodwaters. This brings us to the issue of geoengineering programs and the control of the weather which has been ongoing for many decades. Here's what we know about these programs. We know that they exist because today we can easily look up and see them spraying our once very clear and very blue skies. The many patents owned by the United States government for the act of dispersing mixed chemicals into our skies only serve to confirm the motive of what we already know since patents functionally protect exclusive profits for the patent owner. We know the Air Force has a training manual addressing the topic of chemicals and the science of chemical dispersing. And this is almost as shocking as this list of topics covered at the 29th Conference on Hurricanes and Tropical Meteorology demonstrating that hurricanes are indeed engineered. The process of chemical injection into the atmosphere has been exposed by whistleblowers and has even been admitted by our own politicians then included in the Space Preservation Act of 2001. And these government documents describe in details techniques specifically for engineered weather modification for anyone still not convinced. Putting aside all the atmospheric spraying proof and techniques and simply looking at what we know about weather manipulation as admitted even by the History channel, one can only wonder how coincidental it is that Haiti is getting destroyed by yet another "natural" catastrophic event which very likely was engineered. And one can only wonder how eerily similar this looks to a scenario like big brother beating her (Haiti) up and making her pay the price for not going along with the (Clinton corruption) program. One thing we can be sure of is, if this latest hurricane is a deliberate weather wars attack on Haiti it wouldn't be the first time that engineered natural disasters are suspected of being used against another nation state. And we should never cease in our suspicion of this level of intimidation and criminality.